During the summer of 1917, the Turks were blocking the road to Palestine. 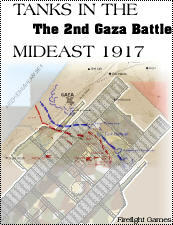 They had been retreating until reaching the Gaza, where there reinforced and built extensive trench defenses. The Turks were always tough and after the 1st Battle of Gaza slipped through the British hands, the British also re-equipped with tanks! It was hoped that these monsters would wreck the Turk defenses and cause them to flee opening up Palestine to the British. Naval monitors would bombard Gaza from the sea. The Turks were not easy prey especially in prepared defenses and with the help of German aircraft above. Once again both prepared for yet another showdown. 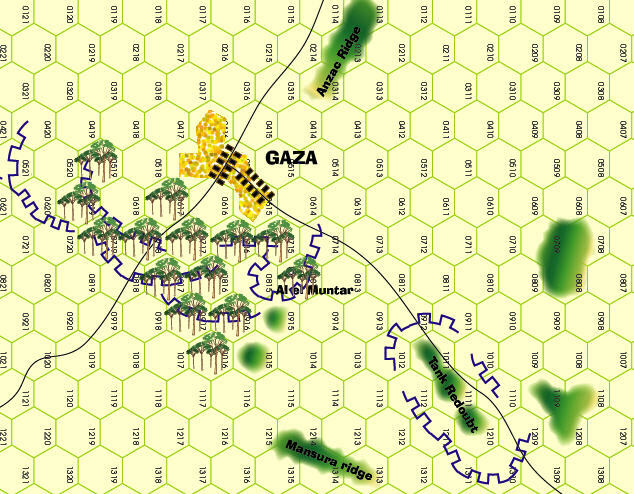 The map scale is about 800 yards per hex. Each combat unit is one platoon to company.